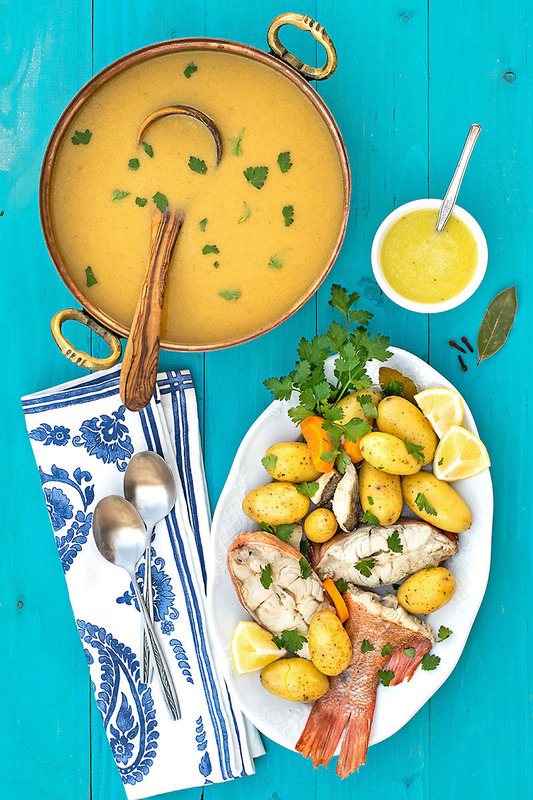 This Greek fish soup with potatoes and vegetables is a healthy and naturally gluten-free recipe for a wholesome and cozy family dinner. 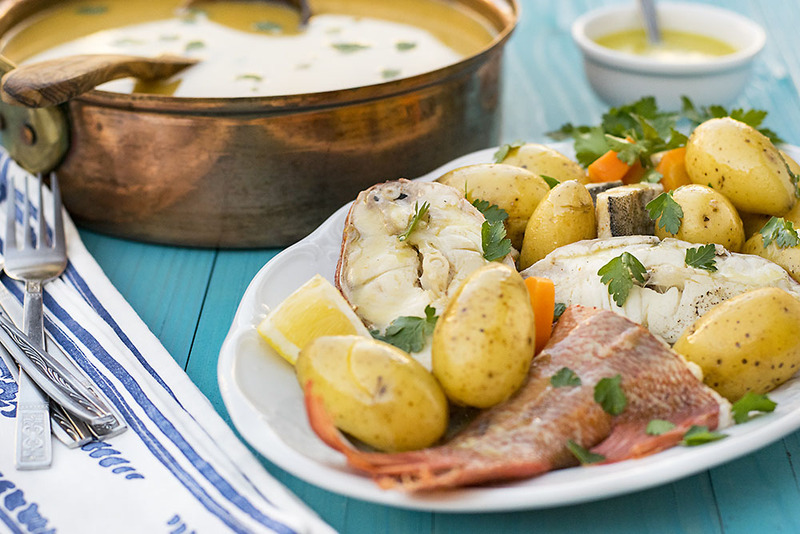 This healthy Greek fish soup with potatoes and vegetables is one of those recipes which give you amazing results with minimal effort. The warm and cozy soup gets thickened by pureeing some of the vegetables and it’s ideal for a comforting and wholesome dinner, especially when the weather gets cold. The fish and the rest of the vegetables are served on a large plate next to the soup, according to the Cretan traditional way. A drizzle of lemon/olive oil dressing is obligatory! This is one of my two most favorite fish recipes (the other being these healthy salmon burgers) and I hope it becomes your favorite too! OK, I don’t want to brag, but my mom makes the best fish soup in Crete. Seriously! And this is not only me saying this… Anyone who has ever eaten her fish soup confirms that it’s the best soup he’s ever tasted. So make sure you pin it, bookmark it, print it, or do whatever you do with your favorite recipes because you’ll want to make it again and again! And the secret? 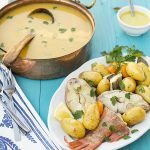 Except for the pureed vegetables which give body and flavor to the soup, a few cloves lend warmth and compliment the aroma of the fish. 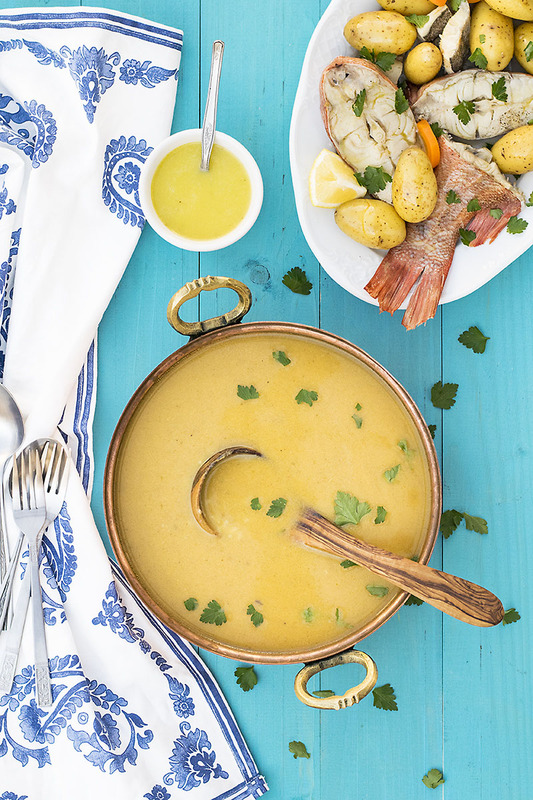 In this fish soup, except the pureed vegetables, another thickening technique is used which you may find strange, but it is actually a Greek classic. An egg gets beaten with some freshly squeezed lemon juice and then gets gradually mixed in the soup. This is called “avgolemono” which means “egg and lemon” but in one word. The only thing you have to be careful of is to gradually add the hot soup to the beaten egg, half a cup at a time, to prevent it from curdling. And don’t worry; the temperature of the soup will completely cook the egg! Don’t omit the cloves! They play a major role in this recipe. Use good quality fish. Fresh fish is always best but a good quality frozen one will also give you great results. Red snapper and some pieces of cod is my family’s favorite combination, but you may use other types of white fatty fish, too. It’s very important to use skin-on and bone-in fish, since this is going to give flavor to the soup. Reheat this soup gently, without letting it come to a boil for the egg not to curdle. Fish Molly/Kerala style fish stew from Pepper Delight (Indian cuisine). An easy, fragrant and exotic recipe straight from Kerala! Scale the fish (if not scaled) and rub it with some lemon juice. Rinse well and drain. Transfer the water, the potatoes, the carrot, the tomato, the onion, the parsley, the bay leaves, the salt and pepper, and the cloves to a large pot, cover and bring to a boil. Boil for 15 minutes, add the fish and continue cooking for another 15-20 minutes until the fish is cooked through. 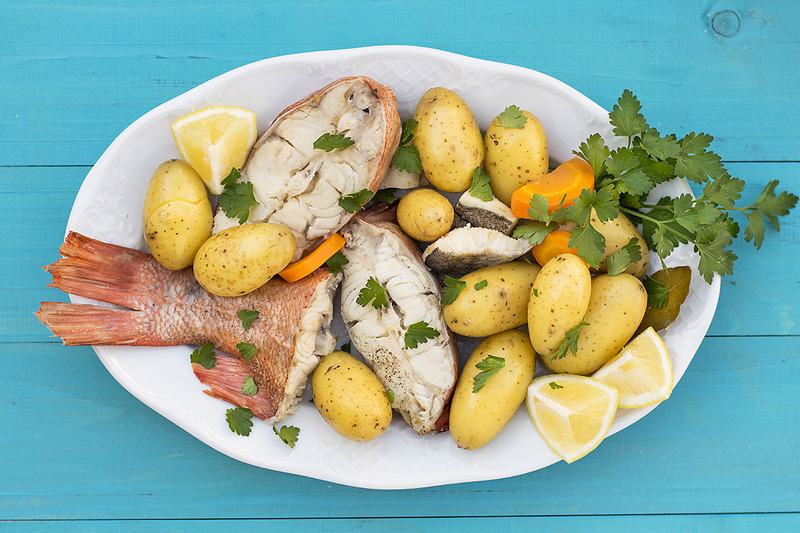 Using a slotted spoon, remove the fish, most of the potatoes (leave 4-5 pieces) and half the carrots, and transfer them to a plate. Keep it warm inside a warm oven. Discard the bay leaves and the cloves and puree the rest of the vegetables using an immersion blender (you can also transfer the vegetables and some of the liquid in a blender and blend until smooth). Return the soup to the stove, add the rice, bring to a gentle simmer and cook for 15 minutes or until the rice is done. Turn off the stove. Transfer the egg, lemon juice and olive oil to a medium bowl and beat with a fork to combine. Add 3 cups of the soup to the lemon-egg mixture gradually, half a cup at a time, beating constantly with a fork to prevent the egg from curdling. Return the soup to the pot and stir well. Taste and adjust the salt, pepper and lemon juice to your liking. Transfer the ingredients for the dressing to a shaker or jar and shake well to combine. Drizzle the dressing over the fish and the vegetables and serve them next to the soup. Remove skin and bones before eating the fish. Beautiful recipe! Pinned (twice) and looking forward to making it very soon… Thank you for sharing! Thank you very much Michele!!! Oh my gosh Makos! This looks freaaaaaaaaaaaaaakin’ awesome! The only other fish soup I ever had was made by my mom also and I kinda missed it. I never really attempted to make it because I’m always afraid I’d end up making fish mush instead haha! But now I definitely must try this, especially since it’s your mom’s recipe! I love learning about the egg and lemon thickening method, the soup looks so fantastically creamy! Whee! Can you tell I’m excited? Thank you Joyce! Yes, moms make the best soups, right? If it wasn’t for that 14th “a” in freaaakin’ I would never have guessed you’re excited! Haha! This sounds interesting! 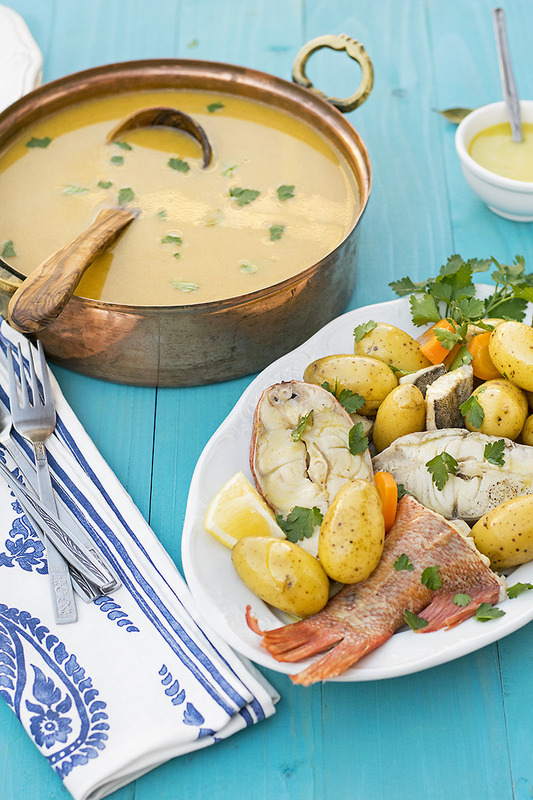 Although I hail from a coastal region with a lot of seafood in my daily diet, I never have tried a fish soup. Another new dish for me to try, Thank You for the recipe.